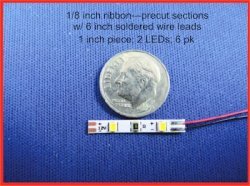 Made with the extremely small 0603, Nano, size LEDs, this strip becomes the smallest LED strip made. We call it a ribbon of LEDs. 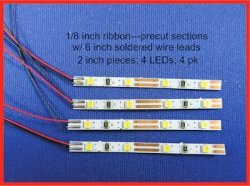 The full strip is 15 inches long with 30 LEDs and less than 1/8th inch wide. It has a 3M adhesive backing for easy installation. 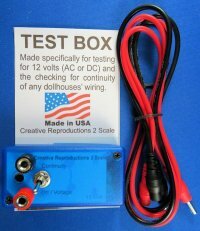 The ribbon works with a 12 volt, DC current only. 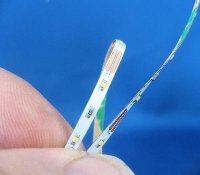 It can be cut at every two LEDs: A new set of wires can then be soldered to the remaining section. These strips are available in Pure White and Warm White. They are also sold in packages of individually cut lengths of 1 inch pieces, 2 inch pieces and 6 inch pieces. 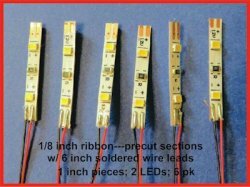 A perfect strip to illuminate small 1/4 scale and 1/2 scale projects as well as illuminating display hutches or those kitchen cabinets in your dollhouse. 1/8 inch ribbon precut at 1" pieces with 6 inch 32 Awg Kynar wire leads attached. Six, one inch pieces per package. 1/8 inch ribbon precut at 2" pieces with 6 inch 32 Awg Kynar wire leads attached. Four, two inch pieces per package. 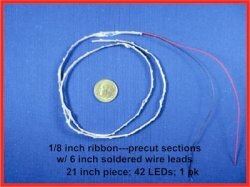 1/8 inch ribbon precut at 6" pieces with 6 inch 32 Awg Kynar wire leads attached. Two, six inch pieces per package.